This Scale Aircraft Conversions set for the Kitty Hawk 1/48 Su-34 Fullback. Typical of many heavyweight Russian aircraft, the gear assemblies are quite complex. This one has more struts and braces than I've seen in an aircraft in a long time. Five of the major castings are for the main and nose gear with several smaller ones for links and retraction struts. A nice addition to the set is a metal boarding ladder. 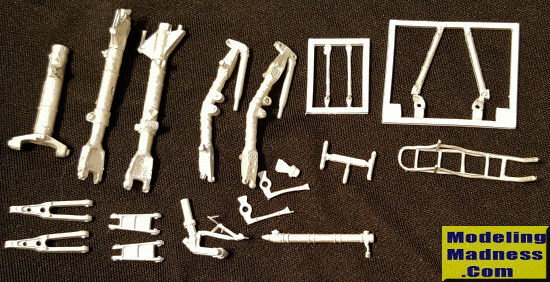 These are direct replacements for the kit parts and are nicely molded.